As a wise man once said, you can never have enough software update releases. Or at least someone inside Apple probably said it before hitting the big red button yesterday. 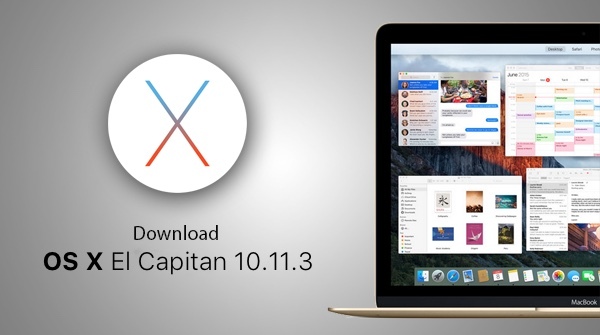 After releasing iOS 9.2.1 beta 1 earlier today, Apple has now released its first OS X El Capitan 10.11.3 beta to developers, with beta 1 version arriving in the hands of testers just a week after final version of OS X 10.11.2 was made available to the public. That release was a minor one, bringing with it a host of bug fixes as well as performance improvements for all manner of things including WiFi and AirDrop. The newly released OS X 10.11.3 beta 1 can be downloaded by developers from the Apple Developer Center, with this release carrying build number 15D9c. It’s not yet known what improvements this first beta release brings with it given its close proximity to the public release of OS X 10.11.2. As is the case with these beta releases, it’s possible that OS X 10.11.3 beta 1 in its current guise mainly consists of more bug fixes rather then fancy new features. Whatever is new however we would expect to see more beta releases of this new update to El Capitan before it is pushed out to the great unwashed masses via the Mac App Store. Apple will want to be sure that the update is ready, unless there is something important, and time sensitive, about its payload – a security fix, for example. Apple’s quick fire release schedule for both iOS and OS X has had plenty of attention over the last year or so, and if these beta releases are anything to go by then the breakneck speed is unlikely to abate any time soon. As soon as we get to know more about this OS X 10.11.3 beta 1 seed, we’ll keep you all updated. Expect news of a new beta release before too much time passes by.